Pippa Middleton and boyfriend James Matthews make public debut at Wimbledon | HELLO! 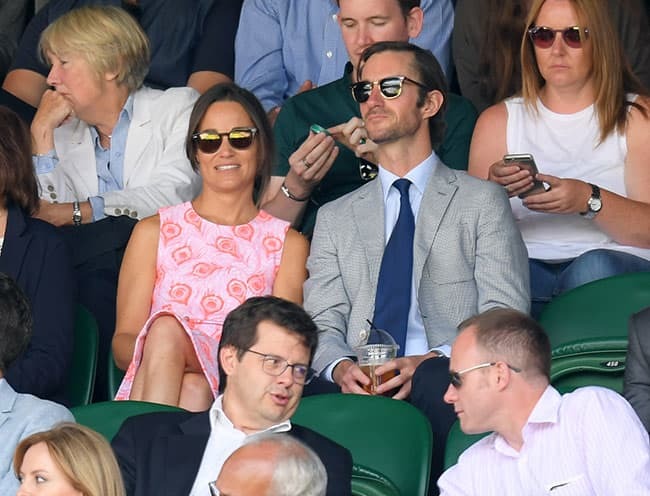 Pippa Middleton made another stylish appearance at Wimbledon on Wednesday – this time with her boyfriend James Matthews in tow. The couple made their first public appearance together at the tennis tournament after over six months of dating. Once again Pippa worked chic courtside style in a pretty pink patterned shift dress and mirrored sunglasses. She wore her hair tied back, and appeared thrilled to be sat alongside James, who looked dapper in a grey suit and blue tie. The couple's outing marks the first public event they have attended together since rekindling their romance at the end of 2015. Pippa, 32, and 40-year-old James – the older brother of Made In Chelsea star Spencer Matthews – first started dating back in 2012. Following their split, she dated banker Nico Jackson for three years, but they ended their relationship in October following his move to Geneva. James and Pippa saw in the New Year together on the Caribbean island of St Barts, where his parents own and manage the exclusive Eden Rock Hotel, and are since reported to have moved in together. Pippa is passionate about tennis and has now sat in the crowd on three separate occasions during the Wimbledon 2016 championships. After wearing a stunning £1,200 Suzannah dress and bold sixties-inspired Tabitha Webb shift dress, Wednesday's outing marked a more understated appearance from the younger sister of the Duchess of Cambridge, née Kate Middleton. Many royal fans have been hoping to catch a glimpse at Kate during the tournament, and while she has yet to sit in the royal box, her siblings Pippa and James, and parents Michael and Carole Middleton have all now watched games on Centre Court.